Former enforcer Amaranthe Lokdon is instructed to undertake a suspicious and high risk mission that results in her being outlawed. Now she’s on the wrong side of the law, fighting not only to elude capture by those who were once her colleagues, but to—somehow—have herself exonerated. Amaranthe is not the only one who has ended up sneaking around corners and trying to get herself removed from the ‘most wanted’ posters! She soon teams up with the notorious assassin, Sicarius, and gradually they build a band of other reluctant rebels. The group work to support the beleaguered young Emperor, Sespian. There are forces at work that want to oust him from the throne, and his unlikely alliance with this band of rebels hoping to earn themselves a pardon, might just be his only means to secure peaceful rule. 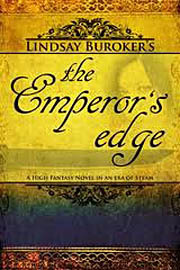 Set in a fantasy, steam-punk world, the Emperor’s Edge series is full of fast-paced, allegiance-changing and high stakes action—with a little romance thrown in.